Do you like to create new year’s resolutions? Do you feel stuck in a rut or in transition in your business, career or life? If so, this article is for you! 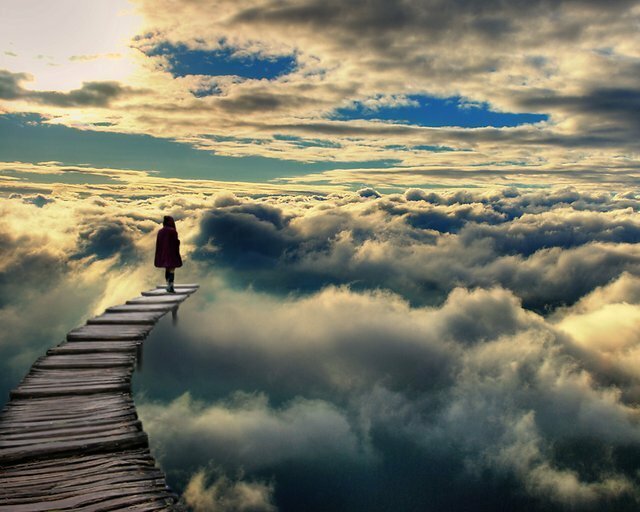 Much like the woman at the end of the bridge in this image, the sky is the limit to where God could take you, if you have a willing heart. Today, I want to talk about the concept of re-inventing yourself and evolving in life with newfound passion and excitement based on a determination to grow. We’ll explore how you can do so, in part, by responding to change or adversity in your world with the right attitude and behavior. If you commit yourself to applying the concepts and actions found below, you will see your life and your career significantly altered, with a greater sense of significance and meaning. I have been blessed to have had the opportunity and courage (not to mention the support of some amazing people around me) to have launched several business ventures in my first dozen or so years as an entrepreneur. Like anyone, I have faced significant personal and professional adversity, at times. And each time, I rebuilt my businesses or started a new one in response. However, you don’t need to start a business to capture the essence of this message. Each person’s life calling and destiny is unique. In dealing with adversity myself, I first look at the people around me and make it about how can I create a bigger future for the greatest number of people first, no matter what adversity I might be facing. I believe it important to always see your future and the future of those around you as being bigger than your past. No matter how bad the personal or professional challenge—be it financial struggles, relationship issues, or the loss of key members of your team—it is critical that you focus on how your life and/or business could be better through a positive response (new perspective, new insights, new talent, etc.) in order to bring about a better future for everyone, not just yourself. There can be beauty in difficulties brought about by our response to these challenges. By focusing on ensuring a brighter future for those you care about most (and those around you within your business/career), you have the unique advantage of operating from an outwardly-focused foundation, not the sinking sands of selfishness. As I survey my past as an entrepreneur, I see a series of challenges that I respond to by reinventing myself or attempting to develop a brighter future for those around me. I started out with my 10x – 1000 Unique Ability Fund Concept, where I set out to develop ten or more businesses in ten or more industries and thereby help a thousand or more people over my lifetime find a role that focused on their passions and unique abilities . This concept tied in directly to my 25 Year Year Transformation process, which always looks toward a future that is brighter than the past. While I am still working on the Unique Ability Fund Concept, the following are a few other personal examples that might help trigger insights and ideas for your future. I wanted to begin an income shifting model in which I would begin to pay myself less from my main business as passive rental income from Destiny River Properties began to grow. I wanted to do this as a means to withhold a portion of my income to benefit the team members that worked so hard over the years helping me to see Sharp Innovations became the stable, successful business that it is. Secondly, the concept beyond the name was that I wanted to work forward from a typical tithe amount (giving 10% of your earnings to the church) towards a reverse tithe (giving 90% of your earnings and living off of 10%) over my lifetime. That remains a lifetime goal, and this company still runs passively in the background with an unknown potential for future success. Looking back on Burning Bush Creative as an off-shoot of my core business at Sharp Innovations, I believe I had a heart focused on creating opportunities not just for financial growth, but for character development and creative expansion within the team around me. My desire was to create something that would further support them (and their dreams) and allow the depths of their passions to be unleashed to benefit the world in an even more bold way than was possible through Sharp Innovations alone. That is still the passion that lies at the core of a currently dormant business plan, pending God’s timing of its activation in our lives and business. Without a doubt, July 24, 2008 became one of the more significant days in my life and career. It was the day I first did a tool from Strategic Coach called “Stage 2 You.” This simple, yet powerful approach to looking at my future challenged me to write down the story of what my life would look like in 3 years on a specific date. I was given a limited space in which this tool allowed me to write this story, so clarity of thought became precious as I wrote. There was a buzz in the air as rough forty entrepreneurs from all over the country sat with me and wrote their own “Stage 2” stories. My story became alive and real as I put pen to paper. I prayed and asked God to review what he saw. And as I wrote, it was like I couldn’t write the story fast enough. Live with Purpose Coaching, and my upcoming book “Running Down Your Dreams” (among other things), wouldn’t exist today if it wasn’t for this tool. My passion for helping empower people to live a life of purpose through coaching, speaking, writing and helping the less fortunate became crystallized in a tangible way. Since then, I have also gone through a powerful 1-year approach called a “Vision Breakthrough.” In this exercise, we write our story a year out and then have it mailed to us a year later so we can review the progress. It is amazing to watch so much of the year’s story become realized, many times beyond what we write down. I would be glad to discuss these concepts with you and help you implement them in your world. Feel free to contact me for a free consultation. I am big on taking concepts and ideas and trying to distill them down to actionable items. Even though the tools named above are most helpful in taking the steps of planning, here are some additional items to consider if you want to take your first steps towards your own “Stage 2” story! Pick a location that stimulates you and unlocks your passion. Don’t overlook how critical this is. It could be a secret outdoor location that is significant to you and/or your significant other. It could be an ideal off-site location where your team does management retreats, or it could be an out of the way café that is simple but effective in its ability to stimulate your thinking. o Always make sure your contribution to the world is greater than your reward as you pursue your dreams. o Always envision your future as bigger than your past. This becomes the fuel for running down dreams. o You will live a life of greater purpose and meaning when you focus first on how your dreams can create a bigger future for others. Posted in Business Tools, Entrepreneurs, Leadership, Spiritual Insights and tagged next phase in life, next season in life, next steps in life, stage 2 you on January 27, 2011 by joesharp.